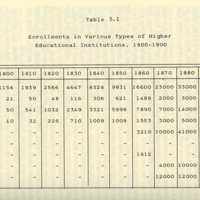 A table showing enrollment in various types of higher education, including liberal arts, law, medical, theological, normal, military, scientific, technical, and women's colleges, between the years 1800 and 1900. 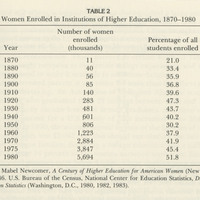 Table showing number of women enrolled in higher education institutions versus total student populations. Covers years 1870 - 1980.